They’re like Romeo and Juliet without the smooching or tragedy. Pinkie and The Blue Boy are from the hallows of the past, yet they’re forever young and intriguing. And they always, always go together. Surely the same artist painted The Blue Boy and Pinkie to go together. I mean, check out their names! Blue and Pink must have shared a childhood love. My future romance-author’s mind went Ca-razy coming up with their story, which dealt with pirates and an old seadog and a HEA. Alas, the truth of why they are together is far less melodramatic than my musings. And at the same time, the facts behind the portraits are stories in and of themselves. Stories of the portraits first. The Blue Boy was painted in 1770 by English artist Thomas Gainsborough. He was a popular Georgian-era artist, whose work was sought by many wealthy patrons. Jonathan Buttall kept the painting until he filed for bankruptcy in 1796. The painting, which was already admired in England, changed hands several times, until something shocking happened. It was purchased by an American. Recently, singer Kelly Clarkson purchased a ring once owned by Jane Austen. The hue and cry in Britain compelled Clarkson to sell back the ring, which will now remain in the UK. The British were no less impassioned when American railway pioneer Henry Edwards Huntington bought The Blue Boy around 1922 for $728,000 (something like $8 million now). Before its departure to California, 90,000 visitors came to the National Gallery to bid it farewell, and the Gallery’s director Charles Holmes scrawled “Au Revoir, C.H.” on the back. And so The Blue Boy went Hollywood. Well, an hour’s drive away from Hollywood, to reside in Huntington’s San Marino mansion (now a museum and library). But what about Pinkie? Some twenty-four years after The Blue Boy was painted, Pinkie was completed by another popular Georgian-era artist, Sir Thomas Lawrence. Lawrence painted royalty and nobility, but also took a commissions from regular folks, like the woman who wanted to immortalize her eleven-year-old granddaughter, Sarah Goodin Barrett Moulton, aka Pinkie. Pinkie (yes, that's what her family called her) was born to a merchant family in Jamaica, 1783, but later sailed to England with her siblings to get their educations. In 1793, Pinkie’s grandmother wrote to her niece in Surrey, asking her to commission a portrait of "my dear little Pinkey … as I cannot gratify myself with the Original, I must beg the favour of You to have her picture drawn at full Length by one of the best Masters, in an easy Careless attitude". No doubt the family was very pleased by the portrait. A few weeks ago, I saw the original portraits. They gaze at one another from opposite ends of the gallery. Pinkie is lovelier in person than photos do justice. She is bright and clean, a glimmer of light and youth and beauty. Likewise, The Blue Boy is regal and dashing. I was amazed to see that his buttons and coat trim had the shine of silver in them. Though the images are familiar, the subjects of these paintings are fresh, children posed in elegant dress, like small adults. They are hopeful and wise and poignant all at once. I’m not sure what Gainsborough and Lawrence would have thought of the unlikely marriage of their subjects. But it is one that compels the viewer—and stirs the imagination—even after two hundred years. Susanne Dietze wishes Blue Boy and Pinkie had gotten married, rather than filing for bankruptcy and dying young. 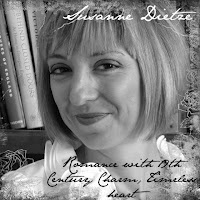 You can commiserate with her in the comments, or find her on her website, www.susannedietze.com. Oh what a story. They must be incredible in person! Good morning, Deb! Yes, the portraits are so much more vibrant and layered in person. I was astonished by the silver in Blue Boy's suit. We are so familiar with reproductions of these images that I didn't expect to be so moved by the originals. I don't know anyone personally who's had a portrait painted. I imagine the cost would be surprising! I never thought about how their outfits are clearly from different eras. It's one of those details that slips by most of us. It certainly did for me. Wow. I have to admit, I always thought Gainsboro painted both - purposely pairing them. Obviously I don't know much about art. But I do know it would be amazing to see the original portraits. I've always loved these portraits. I've seen figurines of both of them, never imagining they didn't really go together. Thanks, Susie! I always thought they must've been by the same artist, too. They're so romantic! Maybe you can see the portraits next time you visit Disneyland <3 Not exactly next door to one another, but the Huntington Library is gorgeous. I have to confess, I don't think I've ever seen either of these before, but what a cool story behind them! Thanks for sharing! Glad you enjoyed it, Niki. I love the room where these portraits are hanging. It's full of larger-then-life portraits and marble busts of Georgian-era famous people like William Pitt and Georgiana, Duchess of Devonshire--just incredible to imagine them sitting for the artists. Fascinating story. I always assumed they were both by Gainsboro, too. Shows what I know. I'm curious about why the girl died so young.